In April of this year, nineteen-year-old Silvia Waight, a resident of Sandhill, was stabbed once to the stomach during an altercation outside of a bar which resulted in another person getting shot. Earlier today, on the advice of the Director of Public Prosecutions, police picked up twenty-six-year-old Lorna Jones and charged her with a single count of Use of Deadly Means of Harm. 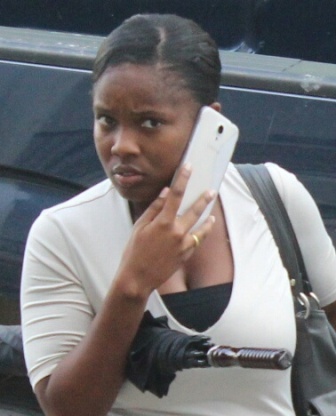 This afternoon, Jones, escorted by CIB personnel, was marched to the Magistrates’ Court where she appeared before Magistrate Dale Cayetano. She met bail in the sum of one thousand dollars, plus one surety of the same amount. The arraignment succeeds a formal report made by Waight. According to Waight, she was socializing at Reeds Bar and Grill when a fight ensued outside of the premises. A woman, whom she knew, approached her and pulled out a shiny object and inflicted the injury. It took seven months before charges against Jones could be levied. Jones returns to court on January nineteenth, 2015.